Onsen for all! The village with hot baths for both humans and monkeys. Happy New Year! I know it is already the end of February, but this is the first note I’ve sent out in 2019, so I feel it still warrants saying. Hoping your year is off to a good start! This month’s postcard comes from Shibu Onsen in Nagano about 2.5 hours from Tokyo. 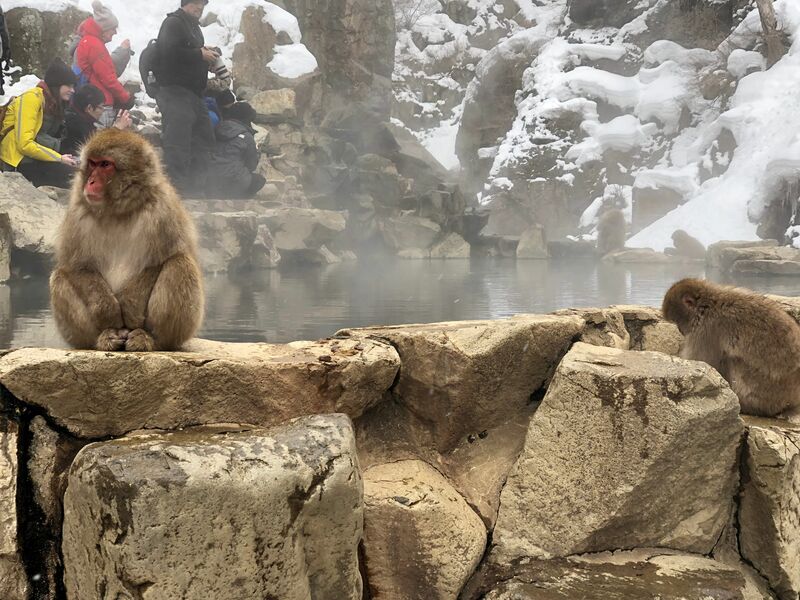 I ventured here because it is the sights of the famous “onsen monkeys,” a troupe of Japanese Macaque monkeys that, over the years, developed the habit of relaxing in hot baths (onsen). Who can blame them? I love hot baths too. I had heard mixed reviews of the monkey park (unnatural, smelly, crowded), so had stayed away from the area until a recent guest asked me if I recommended it or not? I realized I didn’t have an opinion based off of first-hand experience—so I booked the next train from Tokyo and made the journey. 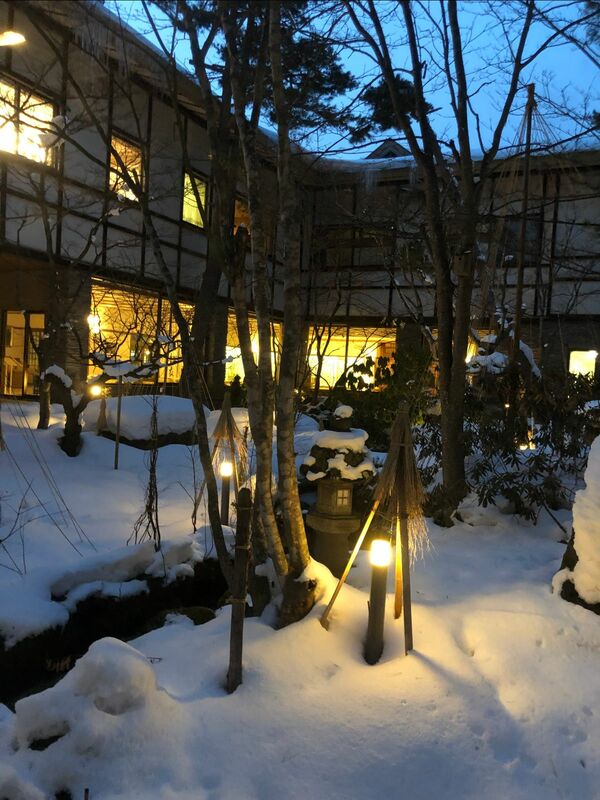 I’m so glad I did, not necessarily because I fell in love with the monkeys, but because of the wealth of amazing onsen (for humans) just outside the park in Shibu Onsen! More notes from my trip below. The trip from Tokyo Station to Yudanaka Station (close to snow monkeys) is very charming. 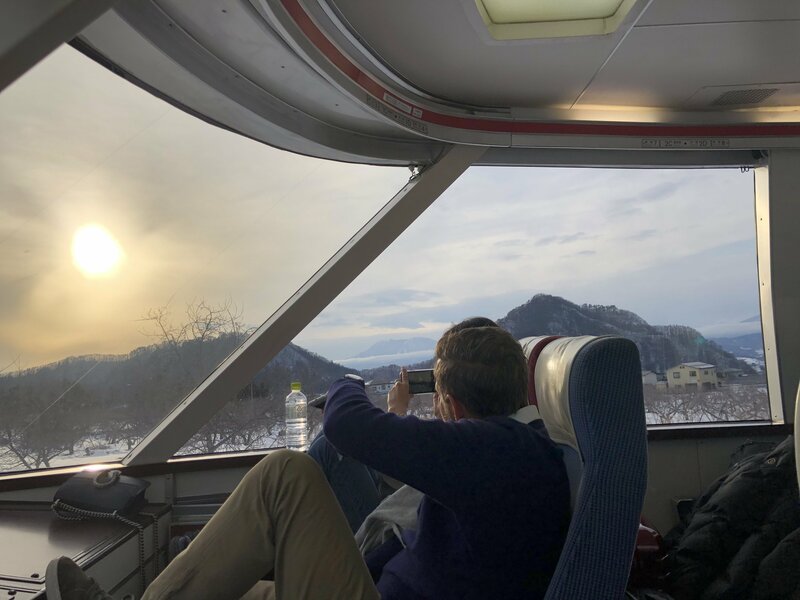 You take the Shinkansen to Nagano and then switch to a local train (Nagano Dentetsu) that has large panoramic windows at the front, so you have an unobstructed view of the scenery. You have to purchase the tickets for local train at Nagano Station - it is very clearly marked. 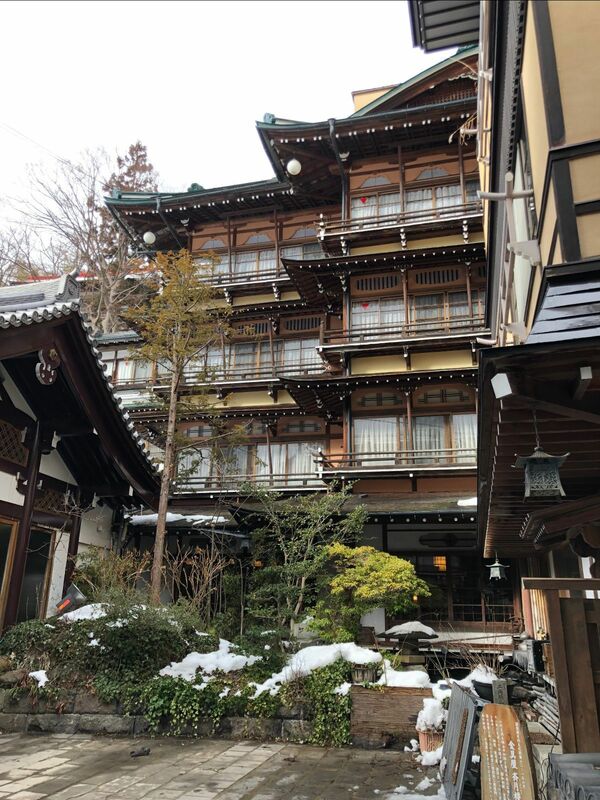 The first night I stayed at Senjukaku, a rather large onsen/ryokan that is walking distance from the entrance to the monkey park—the food was delicious and the service was very personal. If you let them know your train arrival time they’ll pick you up from the station and bring you back to the ryokan (about a 10-minute drive). The hotel is centered around a garden that was so scenic and lit up beautifully at night with the snow. 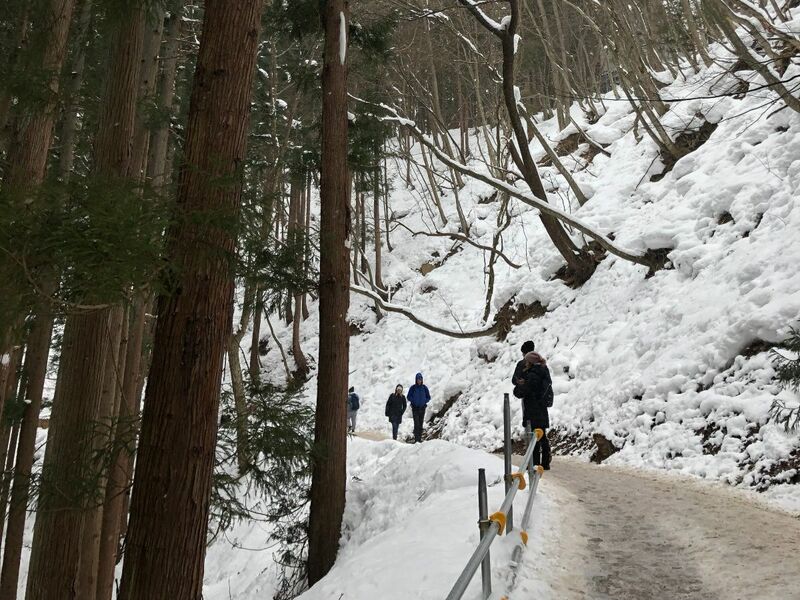 The next morning I walked from the Senjukaku to the snow monkey park it was about 1.5 km. The path there was rather icy and slippery (mid-February). I had on snow boots which helped, but I still slipped a few times. I'd be nervous if anyone felt unsure on their feet to have them walk it. They also have these spikes that you can add onto your shoes for extra grip, I think those are a good idea, looking back I wish I would have gotten them! Viewing the snow monkeys - I have mixed feelings. I was in awe watching them, but I also felt bad because as soon as a monkey did something worthy of a picture lots of people would crowd around and put cameras in their face. I'm sure it is unsettling for them. Otherwise, the crowd was very respectful, and kept conversation to a minimum. The destination is very popular with visitors from around the world, probably one of the most diverse crowds I’ve seen in Japan. I stayed for almost 40 minutes just observing, the monkeys were very charming, as they slid in and out of the bath, cleaned one another, and in general combed the snow for food. After visiting the monkeys I had lunch at The Farmhouse, a cozy home with beers on tap brewed by the local sake distillery, Tamamura. The distillery is in Shibu Onsen, so you can also visit and take a tour to see how they make everything. From Farmhouse I walked downhill to Shibu Onsen (15 minutes) and checked into my next ryokan, Kokuya. 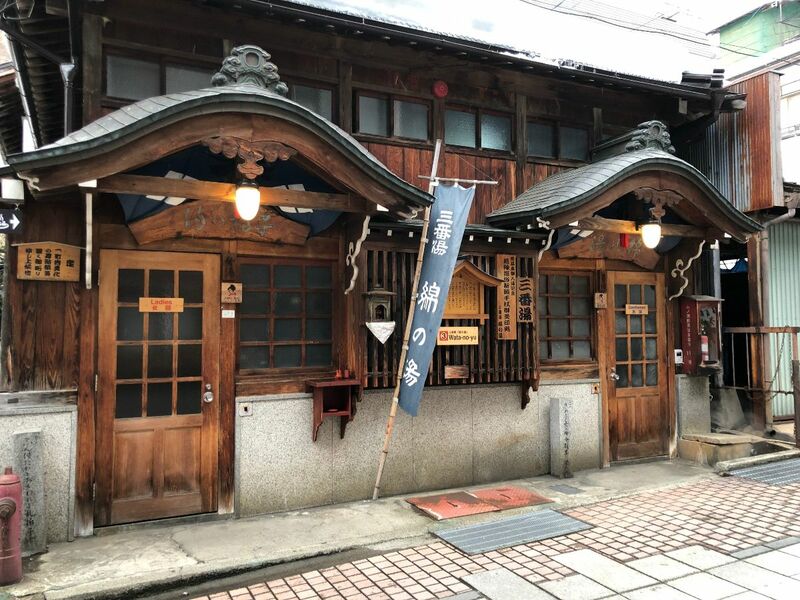 Staying in Shibu onsen is the only way to get a key to the community’s nine, 100% natural, onsen baths. Visiting the baths was my favorite experience of the whole trip. 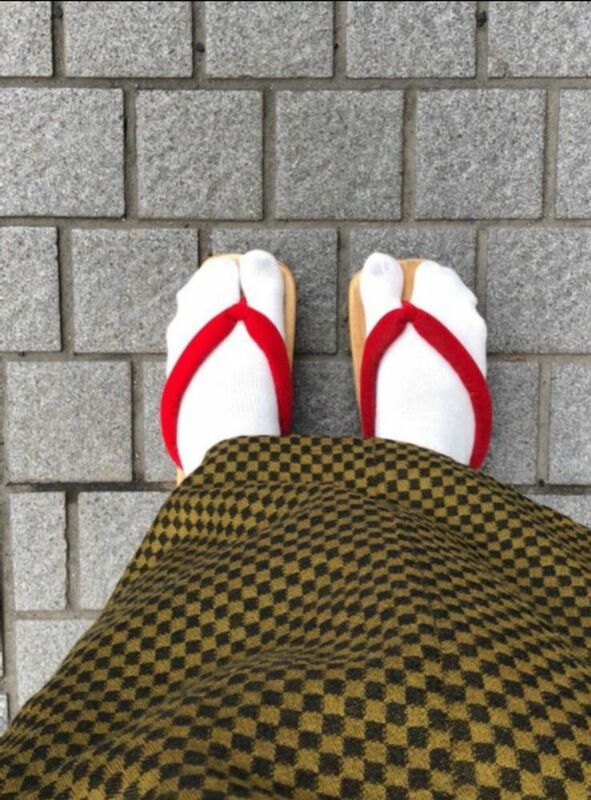 It's such a treat, to be able to walk around the streets in your yukata and wooden sandals, going from bathhouse to bathhouse. The bathhouses are all small (fitting around 6 people), with separate sides for women and men. Families + couples come together and will talk to each other over the wall separating the sexes to say when they are ready to leave. This felt like an old-world bath experience. Not exactly luxurious, or pristine, but pure. Each bathhouse has a different type of water and different temperature water. I made it to 5 before I had to come back to the ryokan to drink water. Now I know to bring a bottle with me when I go out. You have to stay hydrated! So my verdict? I'd say come to Nagano (specifically Shibu) for the baths more than the monkeys. Focus on going to the community baths and experiencing a super traditional onsen town. And if you are interested in skiing you could even combine the trip with a day of skiing at Shiga Kogen - which is close by.